Grizzly bears are known for their size and their ferocity and bears are known to chew into anything and everything they can find. The same might have been the case with eight year old Knute who had bit into something more than he could chew and broke or fractured one of his nine centimeter long incisor tooth. This needed immediate attention as we all know tooth pain is very severe and this can lead to starvation of the bear and death. The problem with Knute’s tooth was first noticed when the staff noticed that Knute was preferring on side of his mouth to chew and was lifting his lips away from the infected tooth. 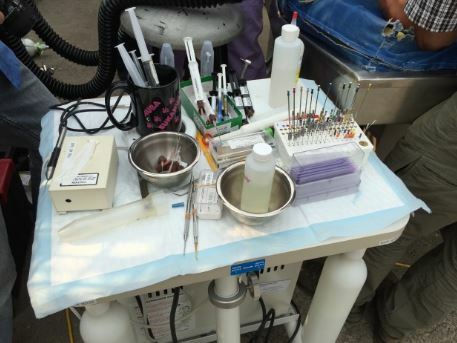 To treat this problem, a team including a dental specialist from Kelowna who is a local large animal specialist, two veterinarians from University of Calgary and other supporting staff to help with the procedure or Root Canal to the Bears tooth. 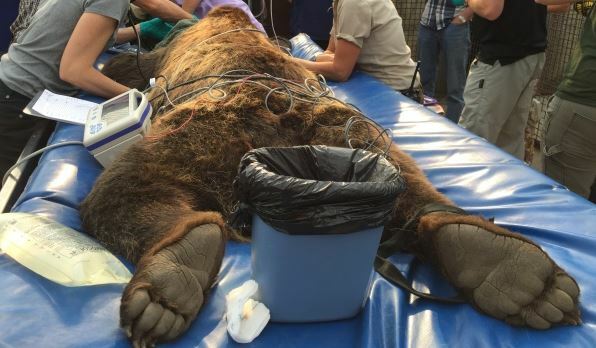 Knute was put under general anesthesia by Veterinary Anaesthesiologist Nigel Caulkett who has experience with putting bears under anesthesia in the wild. As for the diagnostics, it was Alfredo Romero, an instructor in diagnostic imaging and large animal surgery at the University of Calgary who donated his time out of curiosity and and professional development. A Root Canal procedure was to be performed on the Infected Incisor of the Grizzly which was done with the help of instruments which are massive in comparison to the regular Human sized Files, Reamers, Broaches etc. And the GP points were also huge for an Obturation for a tooth of this size.